Spring Meadow Nursery has made the announcement that they have surpassed their million-dollar fundraising goal for breast cancer research. Owner Dale Deppe and PR specialist Natalie Carmolli took the stage prior to the July 16 State of the Industry keynote address at the Cultivate ‘18 conference in Columbus, OH, announcing the Invincibelle Spirit Campaign has surpassed the $1,000,000 goal that was set just under 10 years ago. Deppe made the formal announcement, giving some background about why the Breast Cancer Research Foundation® (BCRF) was chosen to be the recipient of the donations and thanking the growers and gardener centers who have been instrumental in achieving the $1 million goal. Carmolli provided some statistics about breast cancer and talked about its impact on the population and how research is improving survivorship. Since 2009, the Invincibelle Spirit Campaign has supported BCRF by donating one dollar for every Invincibelle® Spirit and Invincibelle® Spirit II hydrangea sold, as well as through Pink Day cause marketing events, which are hosted by independent garden centers across North America. In his Monday morning keynote address, AmericanHort's chief economist Charlie Hall supported the effort, stating marketing that is focused on health and well-being benefits, like the Invincibelle Campaign, resonates with consumers and is part of what will keep the green industry financially strong moving into the future. From the continued H. arborescens breeding of Dr. Tom Ranney, the Invincibelle® Spirit II hydrangea was chosen to exemplify the campaign because of its beautiful pink color and ability to thrive. BCRF was chosen because it is the highest rated breast cancer organization in the U.S. with an A+ rating from Charity Watch and 4 out of 4 stars from Charity Navigator. Allocating .91 of every $1.00 raised to research and awareness, BCRF provides critical funding that fuels advances in tumor biology, genetics, prevention, treatment, metastasis, and survivorship. 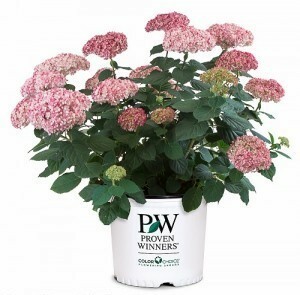 Spring Meadow plans to continue fundraising for BCRF into the future through sales of the Proven Winners® ColorChoice® Invincibelle® Spirit II hydrangea and special fundraising events. Located in Grand Haven, Michigan, Spring Meadow Nursery grows the Invincibelle® Spirit II hydrangea, as well as over 280 varieties, which are marketed under the Proven Winners® ColorChoice® brand. For more information, visit InvincibelleSpirit.net, or ProvenWinners-Shrubs.com. For more information about BCRF, visit bcrf.org.